For city dwellers, low PM2.5 may come at the cost of high CO2. Just what must be done to achieve the best air possible? Most seasoned city dwellers now know a thing or two about how to avoid high levels of ‘the big bad’ of the pollutant world -- PM2.5. If you’re reading this, you may know a thing or two as well. For most, the go-to line of defense for grey-skied, hazy days is to lock yourself indoors and crank up an air purifier. It’s a simple solution and as long as your windows and doors have tight seals, it really is the best way to avoid dirty air. Achieving good overall air quality however, is not so simple. In fact, whilst sealing yourself away from outdoor pollution may reduce your indoor AQI, it also contributes to a new problem - stagnant, stuffy air high in CO2. CO2 may not be a pollutant that comes to mind when you think about air quality. After all, most CO2 in the air comes directly from us, living and breathing in confined indoor spaces. Nonetheless, this molecule also demands your attention as it poses a serious health threat at high levels. The problem of high CO2 is two-fold. Second, there’s the implication of what a high CO2 level means for your indoor environment. In many cases this is more important than the presence of the molecule itself. High CO2 means less oxygen and more bacteria which can spread more easily along with viruses; along with more mold and other harmful fumes, like VOCs. 2,501 - 5,000 Very Unhealthy Headaches and adverse health effects. Increased risk for mold, bacteria and other harmful fumes. 5,000 - 10,000 Hazardous Quickened breathing, nausea. Scared? Don’t be! Eliminating high CO2 levels is as easy as opening a window - literally. The secret for folks in cities with less-than-perfect air quality is to know exactly when it’s healthy to open our windows, and when it’s better to keep them shut. Stay in the know - get a Node! The Node uses its own CO2 and PM2.5 sensors, along with data retrieved from your nearest outdoor station, to tell you the best time to open your windows so that you can perfectly balance clean and fresh air. 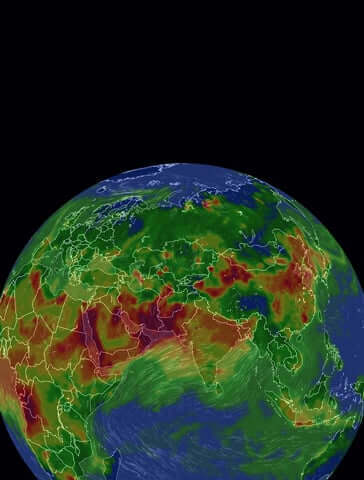 Use AirVisual’s air quality forecast to plan a good time to open your windows and ventilate. Any time outdoor AQI will be under 50, or within the green “good” range, seize the chance for some naturally clean and fresh air! Stay ahead of your local air with the free AirVisual app.